PVC is the material most used in Europe for windows. For its value and its high capacity for thermal insulation, PVC is often the preferred choice for windows. Bet the choice of PVC windows for their quality, design and innovation. Systems Schüco PVC windows meet these qualities in a wide range, offering maximum design freedom with maximum planning security. Please choose from the variety of systems that system, which better fit your project requirements. Basic requirements are perfectly met with a frame mounting depth of 60 mm, 70 mm deep by high demands. Window systems with a depth of 82 mm form the upper range and meet the high requirements of low energy buildings. In VarioTec system has an excellent tool for the construction of private homes, as needed, allows an extension to higher levels of security. Another feature is the hearth without barriers that used on doors to balconies and terraces. Unlike the doors, these doors are also closed at the bottom in the same way as the windows. However, with low mounting depth tripping hazards it is reduced. Sometimes elements made with this system Schüco under own name associated companies Schüco therefore should ask this particular profile system offered. ECOFINESTRES, your shop specializing in products Schüco will inform you. -great margin of creativity with a wide range of tools for glass fixing profiles, handles, element types and opening types in many executions. 5-chamber system which is distinguished by the extraordinary performance of thermal insulation with dimensions of reasonable profile with thickness of 70 mm. Schüco Corona 70 Rondo, together with its special design of EPDM which provides greater sealing. Wide range of solutions for all types of closures special profiles to successfully resolve any situation. High levels of power quality, safety, comfort and design. Upscale windows that meet the highest standards in all European countries. High performance windows in isolation based on 5-chamber profiles. Marco-Sheet = 1.3W / m2K. Visual reduced width, 110 mm in the combination of low profile and standard 120 mm. Catching contours, radios and light marked bias on visible surfaces. Innovative design geometric displaced half leaf surface (concave shape). Double EPDM seal, silver-gray in black and white in forliados profiles. The balanced design of the three Cava, Rondo and Classic models provides an individual to every decor style. Wide range of solutions for all types of closures with special profiles to successfully resolve any situation. Possibility of 20 color finishes for decorative foils. Possibility of incorporating high-performance glass up to 48 mm thick. System 6 and 8 cameras distinguished by the outstanding performance of thermal insulation with dimensions of reasonable profile thickness of 82 mm. In addition to the special design of EPDM, with central board, which provides more tightness and better protects the tool. Upscale windows that meet the highest standards in all European countries. PASSIVHAUS certified. High performance windows in isolation based on profiles 6 and 8cámaras. Marco-Sheet = 0,9W / m2K. Visual reduced width, 120 mm. Triple EPDM seal, silver in black and white gray laminated profiles. Flexible central board technology. Innovative design geometric displaced half leaf surface (concave sheet cava). Possibility of incorporating high-performance glass up to 52 mm with curved blade and blade 64 with champagne. High-performance system designed for the Mediterranean market. Attractive design, profiles that provide greater surface glazed windows. Special development which provide more sealing joints. 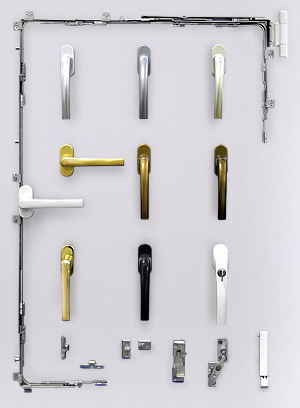 Wide range of solutions for all types of closures, with special profiles to successfully resolve any situation. High levels of power quality, safety, comfort and design. High performance windows in isolation based on profiles of 4 and 3 cameras. Marco-Sheet = 1.6 W / m2K. 60 mm depth and capabilities of glass up to 34 mm. Visual reduced width, 97 mm in the combination of low profile and 113 mm in the standard. Possibility of making French central meeting with handle and centered visual width of only 118 mm. Catching contours, radios and light marked bias on visible surfaces. Geometry with elliptical shapes that produce a visual effect dematerializing size profiles, estilizándolos. Double seal black color, with a very effective design with substitutability. The quality of the fittings and handles is important for the long-term functionality and to achieve reliable operation of the windows.